A peek at the month that was, as inspired by the crafty Pip Lincolne. Reading: Shari Lapena’s The Couple Next Door. John Stott’s The Radical Disciple: Wholehearted Christian Living. Looking: at how green the grass looks. Playing: with the idea of a stall at a car boot sale. We live in such a quiet area that I don’t think anyone would turn up to a garage sale. Have you had a car boot stall before? Deciding: which collections to migrate to my new Bullet journal. It’s a gentle way to reflect on the year that was and what I’d like to carry with me this year. I’m using Milligram’s Utility Journal in a dot grid as my new bujo. There is no back pocket, nor an elastic band to keep it securely closed, so I made my own by pasting an envelope on the inside of the back cover and sewing an elastic I found in my stash as the band. Other than the paper not being cut exactly square with the dots (breathe, Amanda), it’s robust, the quality of the paper superb and it feels lovely in the hand. Wishing: for cooler evenings. I can deal, if I must, with the heat of the day. But at night? I want it cancelled. Liking: Pepe Tomate’s attitude. Not today. Wondering: if I will ever be a good plant mama. I like to think of myself as a good one but I daresay my plants would beg to differ. Loving: my portable folding table. I bought it to use at church (balancing a Bible, journal and pencil case on your lap is impossible), and now it comes with me everywhere. I’m even going to make it a little strap. I’m sure people are staring at me because they are jealous of my table, right? Considering: change. And scrunchies. And my warming to lilac. Buying: 00 flour. This may or may not be an indicator of our current carb consumption. 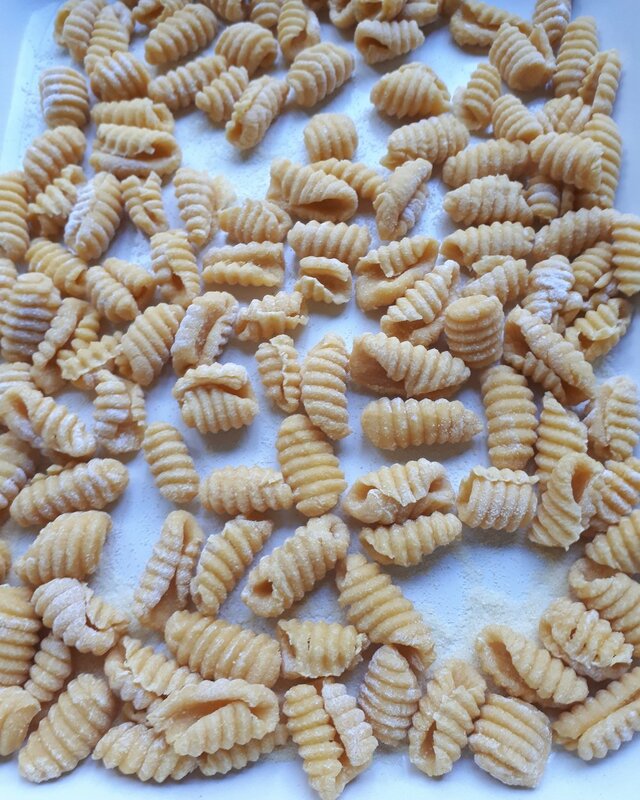 Boy Lex has made pasta his thing and he made most of these gnochetti. He joked that he wants to make pasta by himself every day after school and I am thinking I should take him up on this. Watching: the Fyre festival documentary on Netflix. What a clusterfracas. Hoping: for the softening of hearts. Cringing: at the sound of power tools. Needing: to buy another glue stick. Wearing: no make up. And socks and sandals. Following: a little trail of ants. Noticing: how whenever I watch something in a foreign language, I instantly feel the urge to move to that country. Does this happen to you? Knowing: I’ve so much to learn. About everything. Thinking: about a new-to-me podcast, The Next Right Thing by Emily P Freeman. If you’ve ever struggled to make a decision—no matter the size—then Emily has made this podcast for you. Admiring: resilience. And how we all have it. Sorting: through old t-shirts to make t-shirt yarn. I’m going to make a rag rug for the kitchen. Getting: stuff organised for the school year. Bookmarking: Niki Segnit’s Lateral Cooking. Look, if the patina of my copy of her first book The Flavour Thesaurus is anything to go by, then this book won’t stay pristine for long. Coveting: a craft studio. Or really, a nook big enough to have all my bits and pieces easily accessible. Disliking: how some people use their mobiles on speaker phone in public. Opening: the pantry multiple times, in the hope that I may have missed something interesting to eat the last time I opened it. And lowering my standards of what will do with each subsequent opening. Giggling: at cats on the Internet. This Instagram account (language warning!) has me reaching for a Tena. Feeling: a bit overwhelmed, but hopeful. Snacking: on a secret stash of Lindt balls. Helping: Lex with his Tunisian crochet. He is making a blanket for Pepe Tomate. Watching his little fingers work the hook and his brow furrow in concentration fills me with joy. Learning: how to use a French knitting bee. I’ve dusted it off, thinking it will be the perfect tool to make the little strap I mentioned for my portable table.